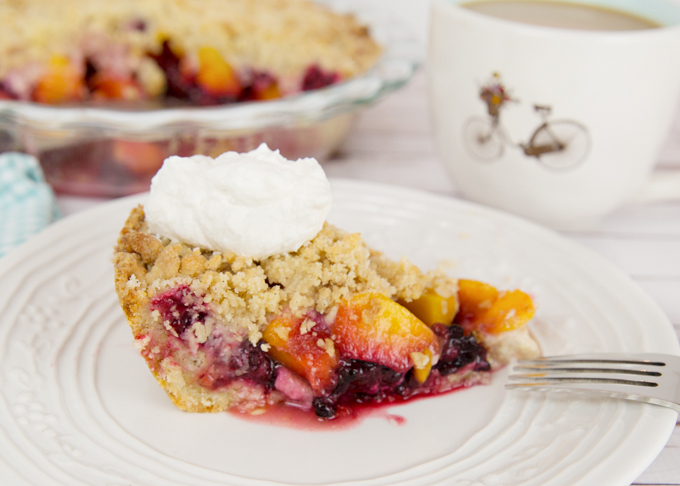 Blackberry Peach Crumble Pie is simple to make and filled with summer’s fresh fruit! Top it with a dollop of freshly whipped cream for the perfect summertime dessert. I was inspired, once again, by An Italian in My Kitchen and her delicious Italian Fresh Peach Crumb Cake. And, since I had a bowl full of juicy peaches that needed to be used and also a huge bag of freshly picked blackberries from our local berry farm in the freezer I knew this was the recipe to make. 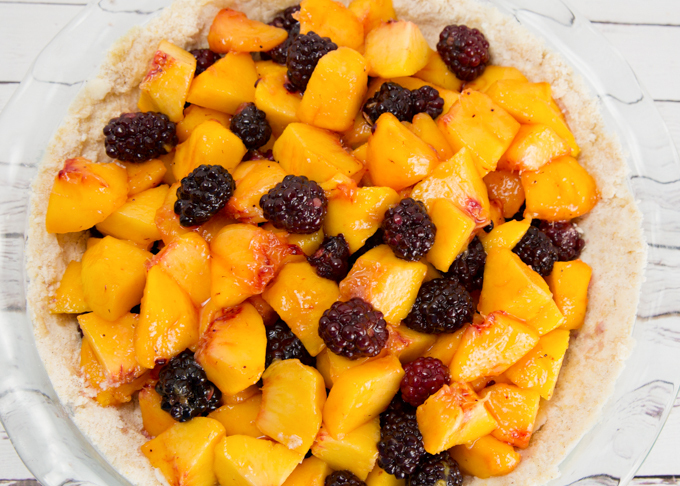 The combination of the sweet juicy peaches along with the tart sweet blackberries seemed like the perfect combination. It turned out delicious, just ask my husband. I had originally planned to make this in my springform pan, but it somehow went missing, and was nowhere to be found. I had a choice then of using a very shallow tart pan, or a deep dish pie pan. Seeing as I’d already sugared the fruit, and had far to much for the tart pan, the deep dish pie pan won out. I knew from this particular recipe, that switching pans from the original was not going to compromise the finished product. 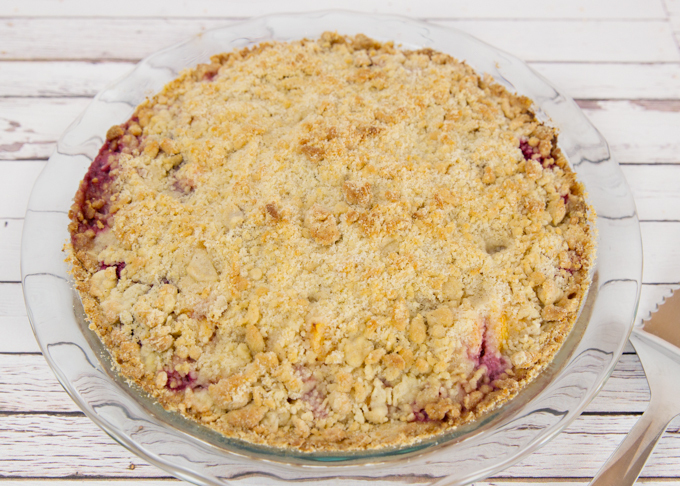 A crumble pie is so easy to make. 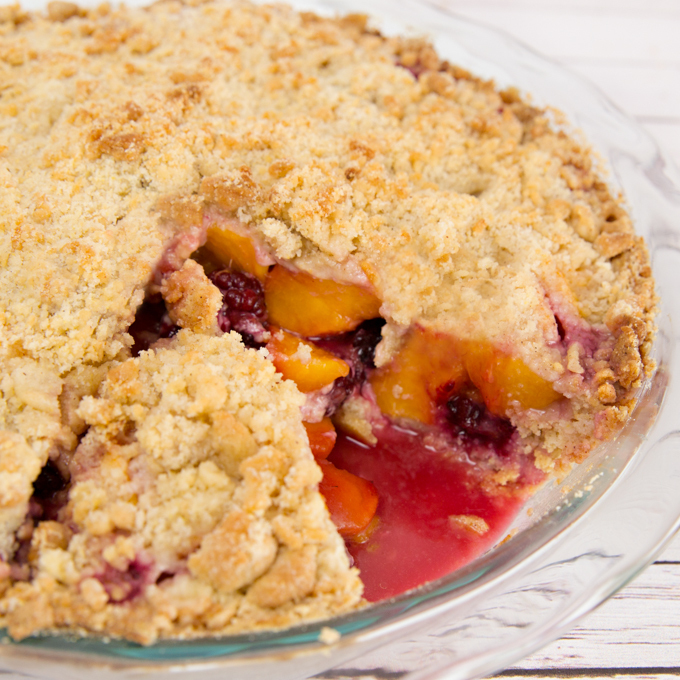 It’s much like a cobbler in the sense that the topping (and the bottom crust) is a crumble and not an actual pastry. Easy! And no finicky pastry crust to roll out. Simply prep your fruit, make up a quick batch of crumble, press it into the pan, add fruit, add more crumble on top, and bake. That’s it! It was prepped and ready to go in the oven in about the time it took me to search for and “not find” my spring form pan. Use large deep dish pie pan or spring form pan. Prep fruit and gently mix with sugar. Set aside. In large bowl, whisk together dry ingredients (flour, sugar, cornmeal, salt and baking powder). Cut cold butter into cubes, and using pasty blender or fork, cut butter into flour mixture. Mix until crumbly. Using a fork, mix together egg and milk until combined. Add egg mixture into flour/butter mixture and combine. Mixture should still be fairly crumbly. Press about ⅔ of crumble mixture into bottom/sides of deep dish pie pan. Top with remaining crumble (do not press, leave loose). Bake in preheated 350* for 45-50 minutes or until golden brown. I love peaches and blackberries. 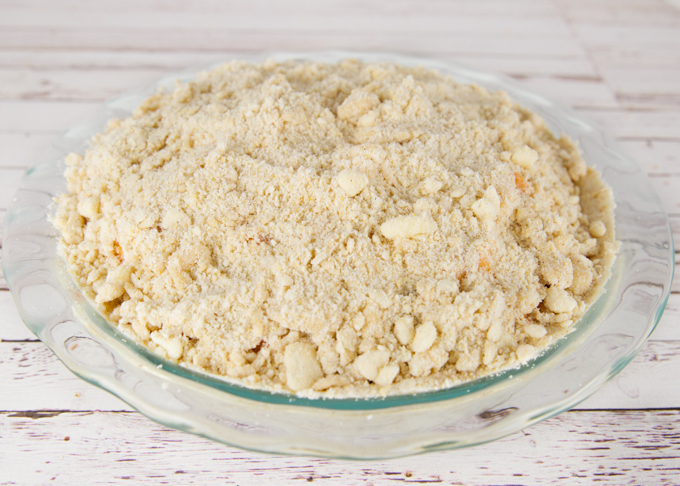 Anything with that crumble topping is definitely happening in my house! Crumb toppings are my favorite! 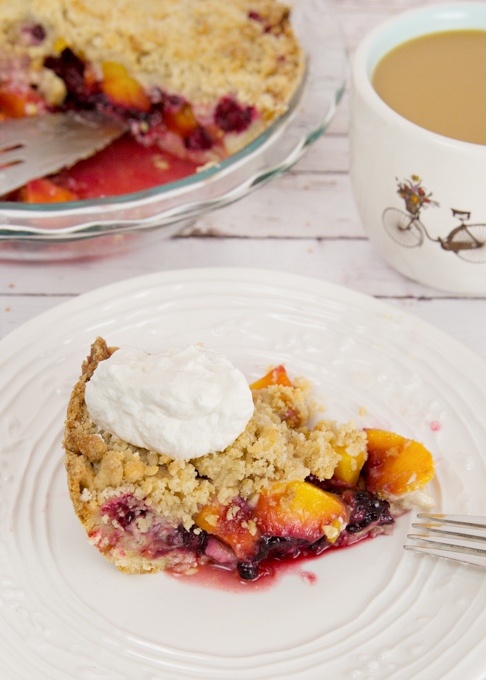 Love the flavor combo on this pie and it screams summer for sure. I was inspired by the same recipe from An Italian in My KItchen! Your idea of turning the bottom into a pie crust is genius – and perfect for this fruit extravaganza.